The JOLTS report is watched closely inside the halls of government. Gary Cohn, the former director of the National Economic Council, called JOLTS, “the one report that everyone in Washington, the geek world, sort of hangs on.” He made the remarks in an interview with Freakonomics radio. Federal Reserve officials also are believed to use the report as a gauge for labor market tightness, a key consideration in formulating monetary policy and determining interest rates. 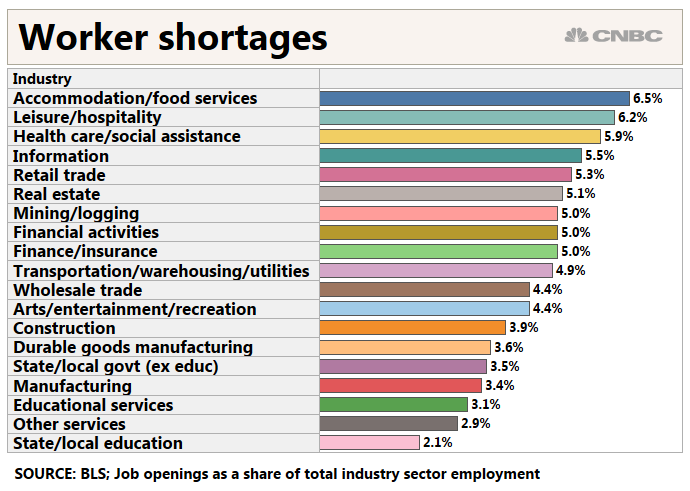 The survey again showed considerably more openings against available labor, a sign of a tightening market. An earlier BLS report indicated 6.5 million Americans qualified as unemployed in January, the most recent month for which data were available. It was the 11 month in a row that job openings exceeding available workers. Openings surged in government jobs, with 59,000 more available. Wholesale trade also showed a gain of 91,000, real estate and rental and leasing increased by 60,000 and information rose by 42,000. Areas seeing fewer openings were “other services” at a decline of 98,000, retail declined by 97,000 and arts entertainment and recreation was off 40,000. The “quits rate,” or measure of workers who left their jobs voluntarily, was unchanged at 2.3 percent of the labor force, though the actual number rose to nearly 3.5 million from about 3.4 million in December. The rate is considered a key measure of worker confidence. The jobs opening rate ticked higher, to 4.8 percent from 4.7 percent. In addition to the gain in openings, BLS revision to prior data showed that there were even more vacancies than previously thought in 2018. The year closed with 7.48 million openings, and revisions added 4.3 million over the course of all 12 months, with the final reading in December revised upward by 144,000.